Some employees get too little training. They sit through a few classroom sessions, see some slides, and get very little help at actually doing their job. Others get too much training. The list of required eLearning courses is too long, and actually takes them away from their responsibilities. The learning and remembering ends up happening outside of, or in spite of, the training requirement. Most organizations invest heavily in training their employees, yet employees still do not retain the critical knowledge they need to be successful. This is why we focus our research on why employees forget. How do our brains respond when we learn new information? Is there a pattern to forgetting? Sharon Boller’s work has explored the divide between remembering and forgetting extensively. Her white paper, When Remembering Really Matters, identifies eight strategies, four for learning and four for remembering, that help fight forgetting. In her presentation, Sharon illustrates how the elements required for learning and remembering fit together into a repeatable process. When used correctly this process, or “recipe,” can yield our desired outcomes. What elements are required to learn? Before we can remember anything, we have to first learn it! Research (and experience) tells us that motivation, relevant practice, and specific, timely feedback are all required for learning… but that’s not the whole story. These are all essential parts of the learning process, but we have to take remembering into consideration to complete our recipe. What elements are required to remember? One particular reason spacing works is that it eliminates the “glop.” With learning, too much = nothing. If you overload the learner with information then none of it will stick. Space the learning out and use repetitions to cement the content. Finally, story helps create context and an emotional response in the learner, both of which are proven to increase retention. This is one of the reasons that games can be such a powerful learning tool. 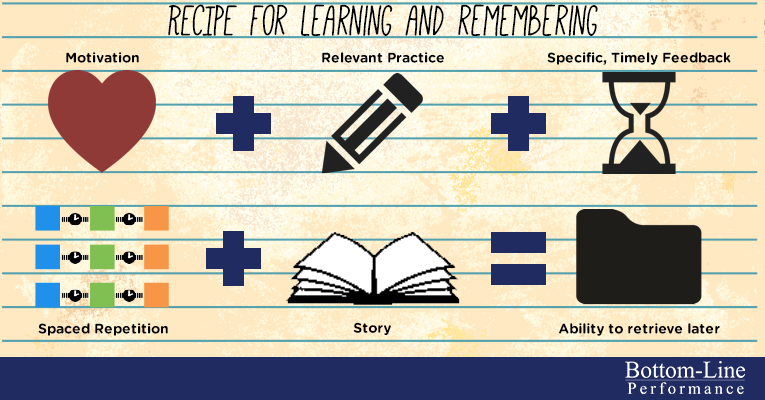 So what’s the real recipe for learning and remembering? Motivation: Employees/players/learners need to be motivated to learn. The most obvious way to do this is to incentivize them somehow, and that can work, but that provides only extrinsic motivation. The best learning happens when the learner is intrinsically motivated. Think about what your learners might need to want to participate in the training. Could you make it more fun? Do they want to compete? Relevant Practice: It is crucial that your learners practice. The saying “practice makes perfect” might be cliche, but it’s true. Think about ways you can encourage practice over time… and make sure it’s relevant to the goals you set. Specific, Timely Feedback: Feedback is one of the most essential ingredients because it allows your learners to correct mistakes and stops them from building any bad habits or repeating incorrect information. Behavioral psychology shows time and time again, however, that the feedback must be specific and it must be quick, so that the learner can make the connections between the correct feedback and their mistake. Spacing and Repetition: Now we’re getting into the ingredients that are crucial to long-term retention. Without repetition at strategically spaced intervals, learners will forget 30 – 90% of what they learned in 2-6 days time. Spaced repetition is the secret to fighting this forgetting curve. Story: As we stated above, story both gives the learner context and creates an emotional element that will help them retrieve the information later. It’s easier to remember an alien telling the safety guidelines that can help you keep your lab safe from invaders than it is to remember those same guidelines from a boring PDF. What do you think of these strategies? Have you applied any of them in your own training? What obstacles make it hard to do so? Want to learn more about remembering? Get four strategies for improving long-term retention in Sharon Boller’s When Remembering Really Matters white paper. How Much Do Corporate Learners Forget After Training? Thank you for sharing Jake. These elements are so important to true learning. As you mentioned, many organizations spend a lot of money building their “training kitchen” but don’t always stock the right ingredients (sticking with your theme). I have been in a training role for a decade and it wasn’t until I started working on my Masters Degree in Training & Development (Roosevelt University), that I really understood what I needed. I knew somewhere deep down that simply “glopping” information on the plate of the learner wasn’t the best plan, but I didn’t understand my alternatives. If I were to add another ingredient, I would make sure to have plenty of upper level support. I have seen many times that management may expect a one-time training to work miracles. Without support, it is hard to space out the learning and provide timely feedback. Would you agree? I am working on a guest post for our blog (www.rutraining.org) and you have given me a lot to consider. Thank you for your help. Thank you for this valuable information, Jake. I agree wholeheartedly with your recipe for successful training. The firm I work for offers a sales course in two formats. One format is to take the course one evening a week for eight weeks and the other format is to take the course for three eight-hour consecutive days. The eight-week course always yields the best results because the participants have time to absorb the training in between classes. Additionally, it enables participants to practice the new material at their jobs each week — and, presenting a report of their practice results during class facilitates even more retention. Also, as a current student in the Masters of Training and Development program at Roosevelt University (www.rutraining.org), I can attest to how valuable it has been to receive my peers’ feedback on my work prior to the final submission of my assignments. I have found this particularly helpful in online courses where I receive specific peer feedback according to the course rubric. As such, I’m able to have insight into things I may have not considered which expands my learning and improves my final submission. As you stated, this works particularly well because it is timely; and the desire to nail the assignment is a great incentive to heed the feedback.